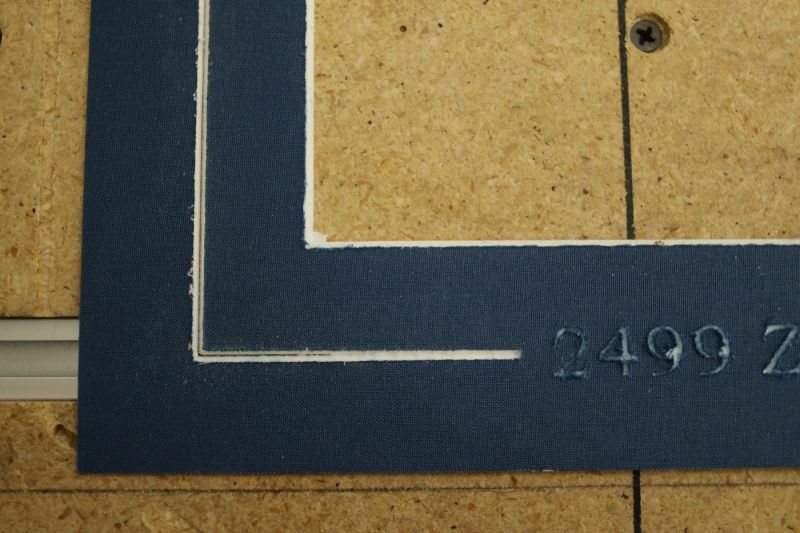 Has anyone had any experience cutting photo mat boards for print framing? I thought for sure it would be a simple task to V-carve the openings and maybe even add some text & designs in the mat board with V bits, but it has proved to be mess. Even with new bits, the carving is relatively ragged, especially at the corners and forget the text! I “think” the problem is the composition of the board material itself, it seems to shred rather than cut cleanly. Any thoughts or suggestions would be appreciated. Get some thin sheets of expanded PVC. Thanks… I thought of that but I’d like to have more colors and the two-tone (pinstripe) effect you get with regular mat board. Sorry to be so picky about this but I did not see any of those drag knives that would deliver a beveled V-cut like a mat cutter would do. Did I miss something? Ironically, our V-bits have the perfect geometry, but just don’t like mat board? You’d need to create a drag knife which holds the knife at an angle, or work up some sort of system where it pulls a mat knife cutter. An ultrasonic cutter could be better than a drag knife but I have yet to see one on a CNC. Thank you… this does look like it would do the job nicely, but it’s a little outside my budget. 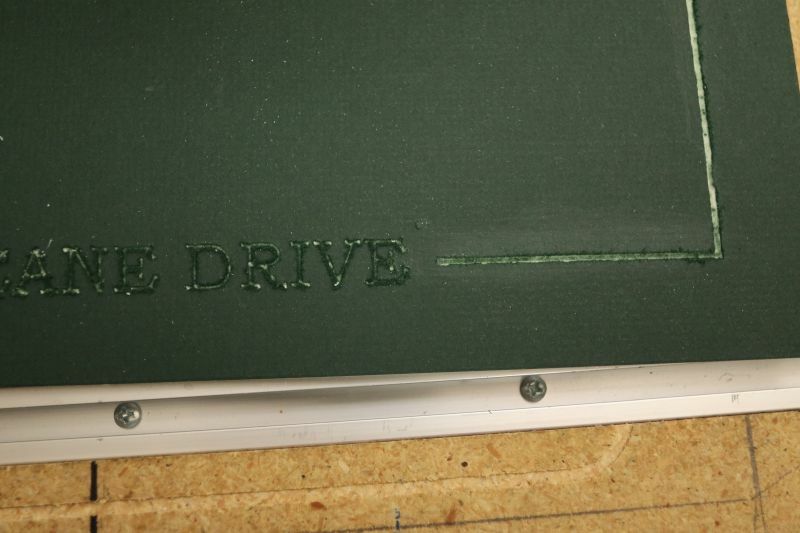 I am thinking 1/16" thick, 2-ply, plastic engraving materials might work for now? Did you try different feed rates and router speeds? Yes… I adjusted the speeds & feeds up & down and the results were nearly identical. I think now the problem is the composition of the mat board? As I looked around the web, I couldn’t find anybody using a router to cut the stuff. It’s too bad because the v-bits have the perfect geometry. Can you sandwich the material under/between other materials, or is the ugly in the middle and not top/bottom? mat boards using 60 & 90 deg v-bits. I’d love to be able to add borders & text too, but that now seems impossible. The attached pictures show two different type of mat board “after” considerable cleanup using new strait edge razor blades. It seems the worst areas are at the inside corners of the openings, but even the straight parts are a mess, let alone the text! I meant putting something on top and on bottom of the material you’re machining, to support the fibers better so you don’t get long tears. In this instance, though, I think the materials just aren’t right for a spinning bit. Try a light coating of Krylon and see if that will hold things together enough for your project. Interesting idea… I will try that and post the result here. Have you considered using a swivel cutting tool attached to the router instead of a v-bit or an endmill to cut the mats? Yes, thank you, I even have a swivel cutter but mats are cut at an angle and this tool can only cut vertical.